Dual Element Immersion Element Deep Fryer. 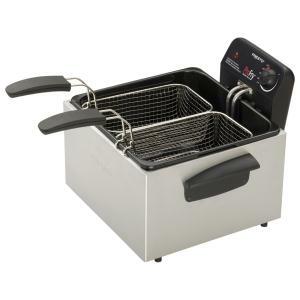 Professional-style deep fryer with dual baskets. Fries two foods at once or extra large batches. Big 12-cup food capacity. Oblong-shaped baskets are ideal for frying large pieces of fish or chicken. 1800-watt immersion element provides quick preheating and fast oil temperature recovery.